This sculpture is a very unique piece commissioned by the Bubble Bee Car Wash in Lakewood, CA, a town in the greater Los Angeles metropolitan area. It was designed to be a permanent fixture in a display case on the exterior wall of the building. While Customers are waiting for their vehicle to be washed, waxed, and detailed, they can marvel at the beauty of this sculpture. The "Bees" float through the landscape and zip through sound elements to delight the visual and auditory senses. What makes this Rolling Ball Sculpture unique is how the artistic mural was incorporated seamlessly with the stainless steel track. I was able to keep the contemporary stainless steel look, while adding the colorful theming. These two attributes create a very visually appealing display that keeps in-line with the car washes image. The sculpture has many elements that delight and captivate everyone who watches it. The Flight of the Bubble Bee is filled with motion and sound. Balls zoom out of the hive and roll down the track to sounds and acrobatics. 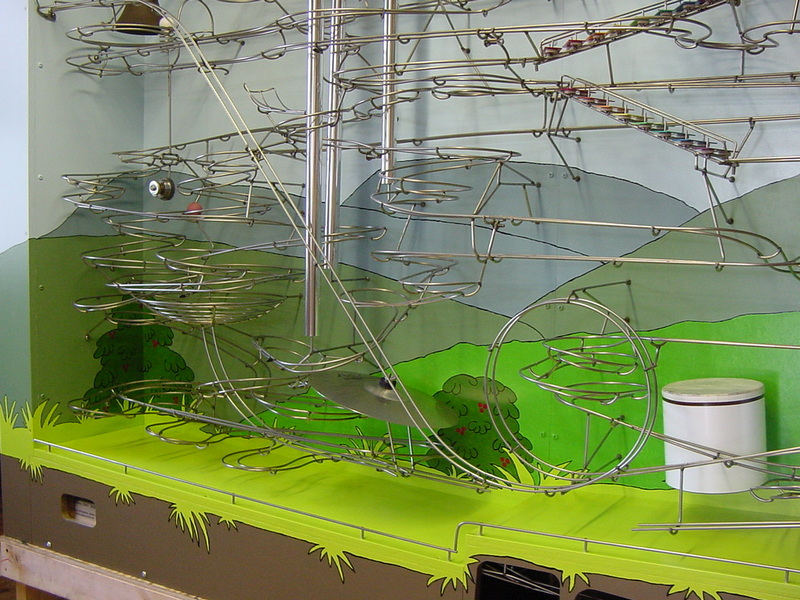 This Sculpture is built in a steel and wood frame, with 3/16" stainless steel, two-rail track. 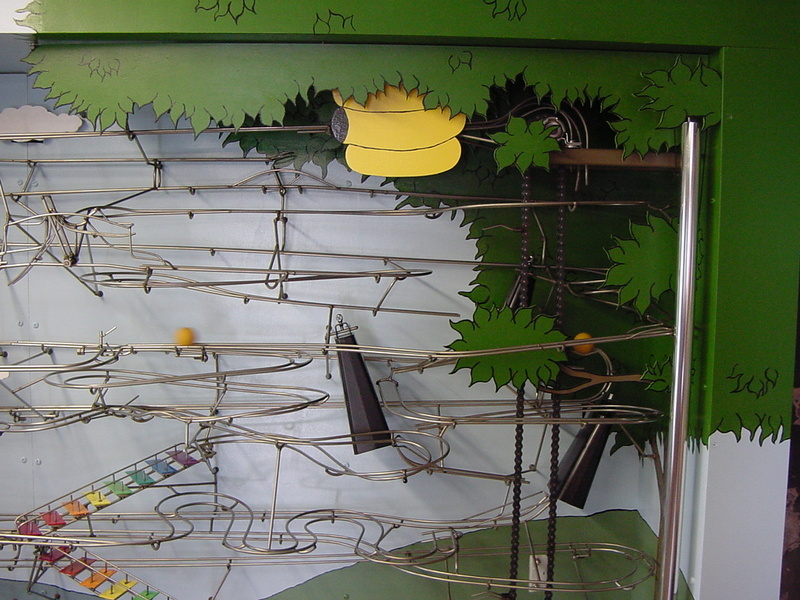 There are 5 track switches, 6 different ball paths, and 13 sound elements. 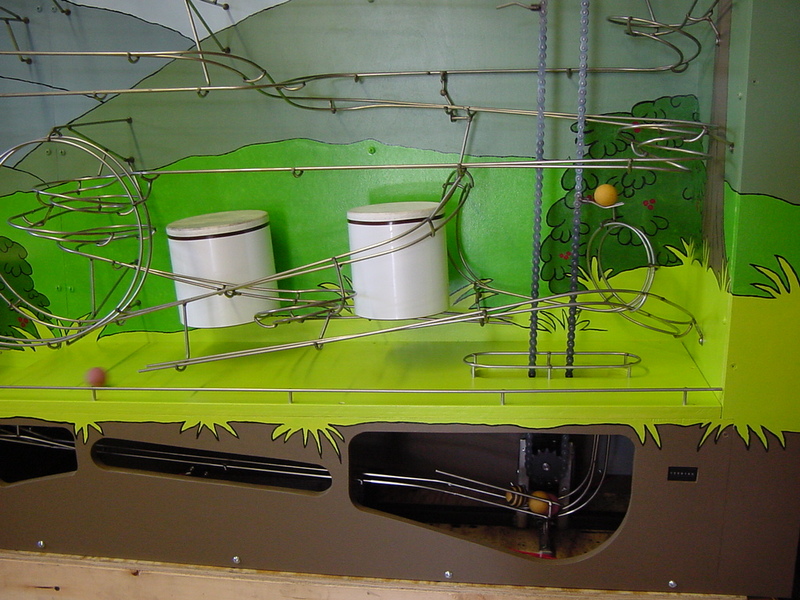 The balls are collected using a unique ball-return system and return to the top using a chain-lift. The sculpture is 8 feet long, 6 feet tall, and 16 inches in depth. Another interesting feature of this sculpture is the ball-counter, which can be seen in the lower right of the display. How long will it take the counter to hit 1 million if the sculpture lifts balls at 6 balls per minute and is run continuously during regular business hours for a year? 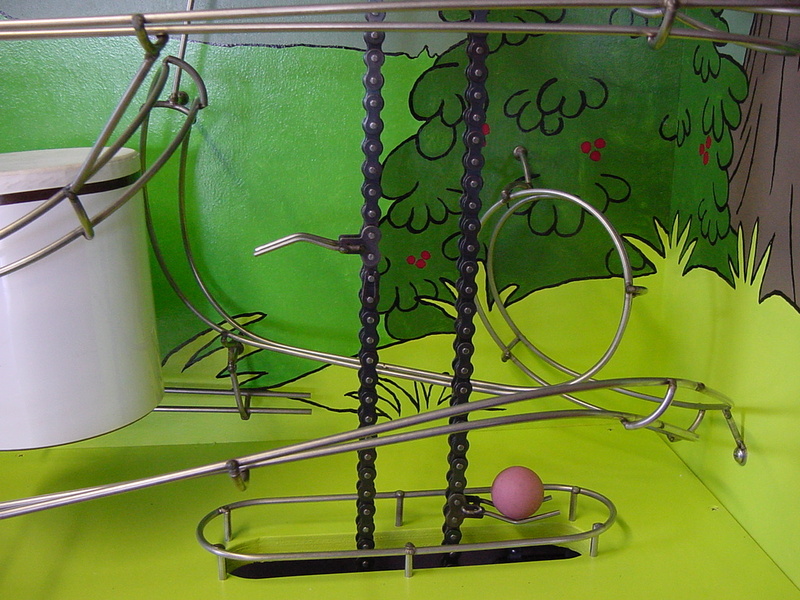 The balls bounce over two drums on their way to a crash in this exciting track element. Balls zoom through a large loop-the-loop, sound chimes, and ring bells on their way back to the ball lift. Before the sculpture was delivered, Shannon Young and Scott Ayers, a news team from the local CBS station WDBJ7, visited my shop and put together a nice piece on my work for the 6 o'clock news. The interview with Shannon Young and the filming of my sculpture was quite fun and just reinforces my belief that these sculptures have magical appeal. Not only was the piece shown on the 6 o'clock news, but a similar segment was shown on the 11 o'clock news as well. I wasn't ready for that one! 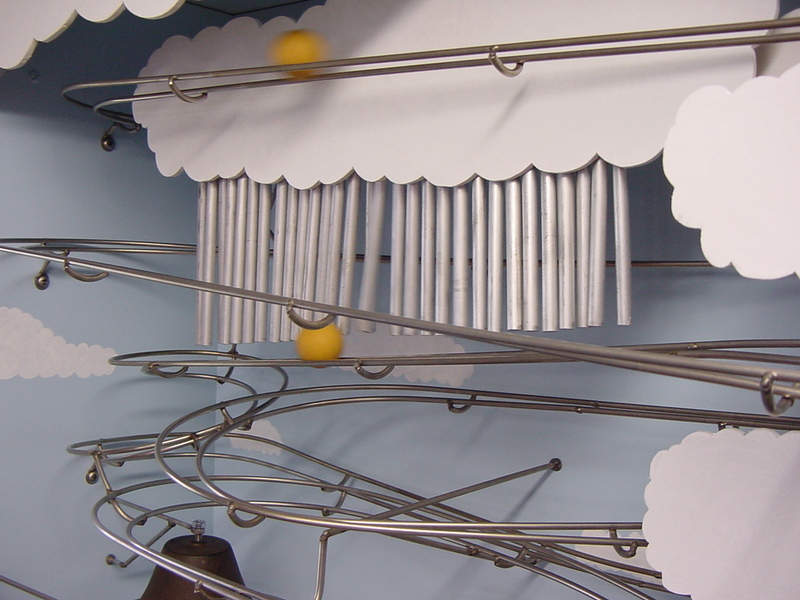 Balls fly through the clouds and ring chimes. 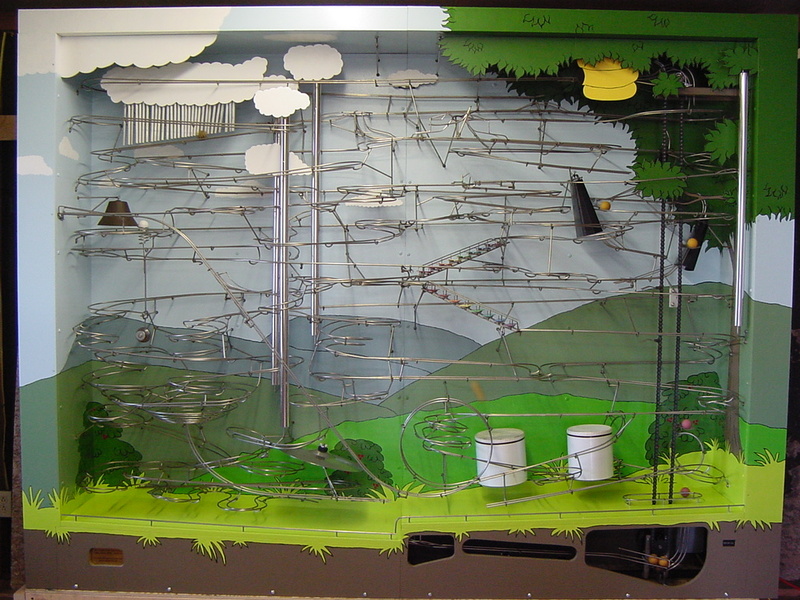 The chain lift brings balls up from the collector below and back to the hive up top.